All Reusable No-Slip Wedge Cushions are now equipped with a new zipper enclosure designed to prevent fluid infiltration. 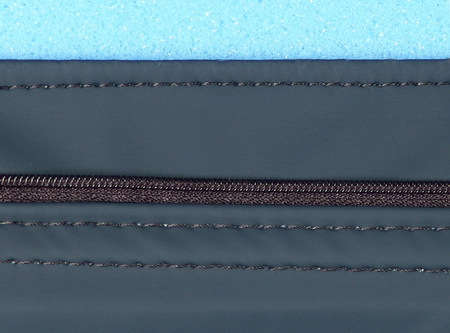 …A raised border of fabric behind the bottom half of the zipper serves as a second barrier to fluid infiltration. Intensive Therapeutics is pleased to offer Dartex as a new cover material option on our Reusable No-Slip Wedge Cushions. Dartex fabric is designed and developed specifically to deliver optimum patient care and wellbeing in the demanding field of pressure ulcer prevention, while enhancing infection control. Through innovations in the knitting and coating process Dartex has pioneered stretch waterproof cover fabrics that are benchmarked throughout the world. Pressure Redistribution – Dartex support surface material is specifically designed to prevent pressure ulcers. Using four way stretch properties, pressure is redistributed and the optimum interface for the body is achieved. Patient comfort is also greatly enhanced. Fluidproof – Dartex fabric maintains waterproof properties under the most demanding healthcare conditions. Using only premium polyurethanes, Dartex fabric exhibits excellent hydrolysis resistance eliminating potential risks from cross contamination both as new and over time. Infection Control – Biostatic (anti-mycotic) coatings provide an impenetrable barrier to virus and bacteria. The Dartex fabric seams are welded, by Radio Frequency Welding. These seams are impermeable to air and water, minimizing the risk of fluid permeation. Biocompatibility – Dartex Fabric is subjected to extensive biocompatibility testing. Dartex Fabric is ‘Oekotex' certified. Dartex is also tested for compliance with ISO 10993 biocompatibility for skin irritation, sensitization and cytotoxicity requirements. Dartex Fabric is latex free. Flame Retardance – Using technical expertise, precise and repeatable manufacturing capabilities, Dartex fabric meets and exceeds today’s most stringent international flame retardant standard, BS EN 7175 and equivalents. Wipe Clean – Ease of cleaning and low maintenance makes Dartex fabrics the ultimate choice for installation in a controlled, hygienic environment. Durability – Taking advantage of Dartex's inherent combinations of anti-mycotic properties and cutting edge polyurethane coating technology also guarantees fabric with excellent durability. Dartex achieves impressive results in flexibility, stretching, aging and abrasion tests ensuring longevity in use. 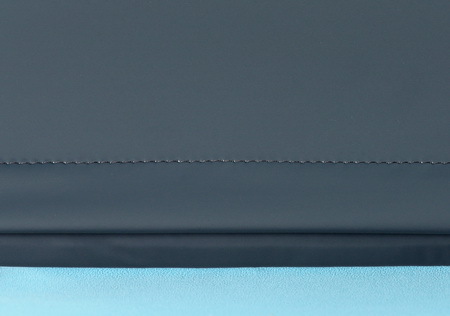 Dartex Cover material with RF welded seams… No stitching! 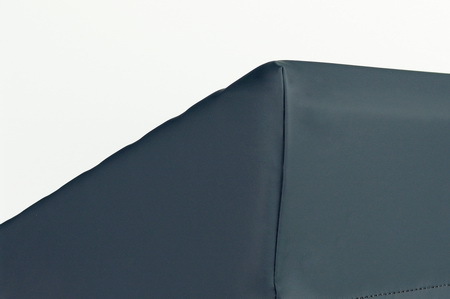 The Dartex Cover option comes with RF welded seams on the patient contact surfaces. RF welded seams are fluid proof. When combined with the new fluid proof zipper enclosure described above, the Dartex Cover is ideal for high infection control standards. Copyright © 2011 Intensive Therapeutics Inc.